Call Backs, if needed will be held on 10/21/17 in the afternoon by invitation. All auditions will be held at the James Lee Community Center Theater located at 2855 Annandale Rd in Falls Church. There are 35+ roles that will be performed by approximately 20 actors. Most of the roles will be cast with adult actors but there are a number of roles (including the plays lead) that will be cast with young actors aged 9- 18. The Phantom Tollbooth is the second production of our 20th anniversary season and is our holiday show offering. Each year, for the holiday production, the Providence Players partners with the The Young Hearts, a group of amazing teens who raise funds to battle blood cancers and other diseases. Half of all net proceeds from this production will be donated to Young Hearts Foundation in pursuit of their important mission. The Providence Players is a twenty-year-old, award-winning, all volunteer, non-profit community theater troupe. An RSVP is necessary for planning purposes only. We do NOT require or make audition reservations or time slot appointments. Select one of the audition sessions to attend and plan on attending as much of the audition session as you are able. We have fun at auditions and you will be up and down multiple times in different scenes and with different audition partners. No monologue is required. Read on for further information. Juster’s acclaimed fantasy adventure comes to life onstage! Milo is bored and the Demons of Ignorance keep telling him “If you get the urge to do anything — don’t. It could be dangerous.” To the rescue comes the Phantom Tollbooth! Aided by a trusty timekeeping dog Tock, they meet many memorable characters in the Land of Wisdom on their quest to rescue the princesses Rhyme and Reason. Based on the classic young adult novel, The Phantom Tollbooth is outstanding entertainment for the whole family. This special production of a holiday treat will benefit the work of The Young Hearts, a group of amazing teens who raise funds to battle blood cancers and other diseases. Half of all net proceeds from this production will be donated to Young Hearts Foundation in pursuit of their important mission. There are some roles (including one lead and two of the featured roles) open to youth aged 9 and older – See the accompanying character/age chart. Auditions will be held IN THE THEATER located to the right of the main desk and up the stairs and to the left. Signs will be posted. Please sign in at the main community center entrance counter. PLEASE PLAN on coming to one audition session and staying for the full audition session or until released by the director (the director will try and get the younger actors out of auditions as quickly as possible). PPF DOES NOT USE AUDITION APPOINTMENTS OR AUDITION SLOTS. PLEASE RSVP to providenceplayers@cox.net with the date you plan on coming to auditions. HOW WE WORK: For this play, please select an audition date to attend and plan on staying for the full session. Most PPF auditions have actors up and down to read multiple times in multiple combinations and scenes. Most actors find this fun. You will be able to sit in the theater and watch all the auditions. You may be asked to go into the hallway with audition partners and work a bit on a scene. We will do our best to get you up multiple times reading for parts you are interested in. You will also be asked to read for other parts you may not be auditioning for. The Providence Players strives to make our productions open to interested and engaged actors & actresses, regardless of their level of experience. We try and make our auditions as relaxing and fun as possible. AUDITION PROCESS: Auditions will consist of readings from the script – No monologue is required. AUDITION SIDES: Sides for the audition process will be supplied at auditions and may be posted on our website. Additional sides may be added at the auditions. 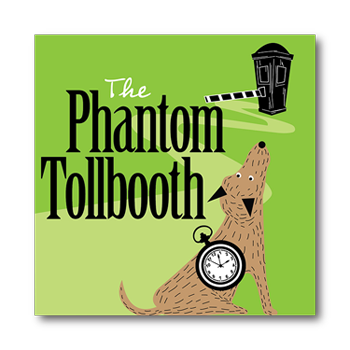 AUDITION SIDES FOR THE PHANTOM TOLLBOOTH WILL BE POSTED ON THIS WEBSITE BY 9 PM 10/11/17. AUDITION FORM: Resumes and headshots will be accepted, but are not required. 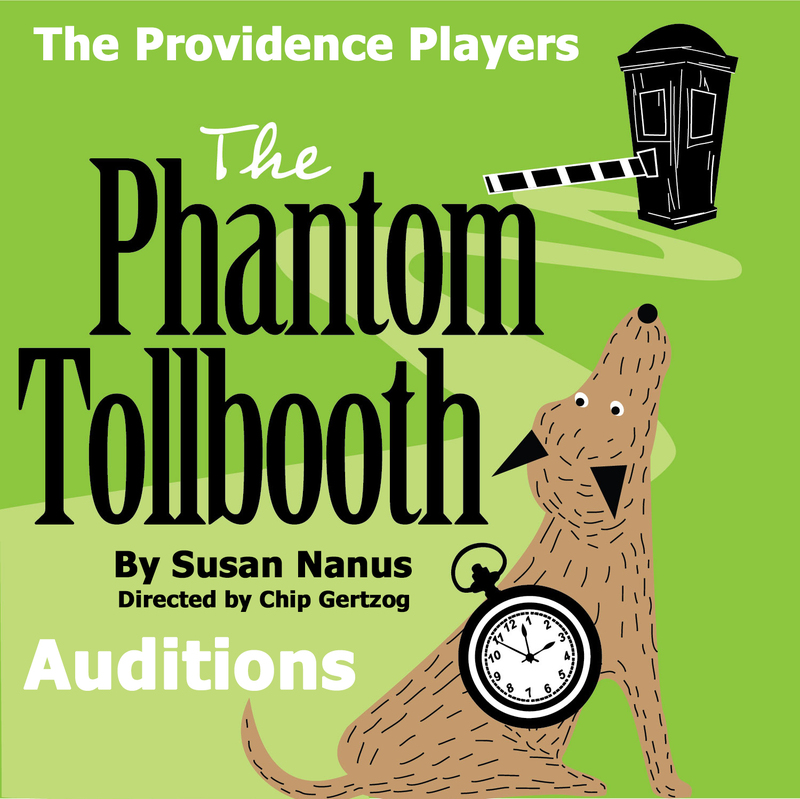 Please ALSO COMPLETE the PPF Phantom Tollbooth Audition Form, which is part of the complete audition download package, and bring it with you to the audition. A copy of the preliminary stage rehearsal schedule is included with this announcement and the complete audition download package and at auditions. Stage rehearsals begin October 24, 2017 and the schedule becomes very intensive in November. Unless indicated otherwise, all rehearsals will happen at the James Lee Community Center. Rehearsals will be held in the evenings roughly from 6:45 to 9:45 pm and on Saturdays and Sundays as indicated. The Phantom Tollbooth is a classic children’s book somewhat in the style of Alice in Wonderland emphasizing the importance of learning, wisdom. Milo is a young boy/girl bored with life who learns through his travels in the Land of Wisdom that excitement and action are all around him. The story inspires imagination and creativity. In simplest terms a tale of ignorance vs. wisdom. It is the story of one boy’s journey through his imagination to develop wisdom while fighting off the demons of ignorance and lethargy. The story is deceptively child-like but is full of more adult concepts including many verbal and visual puns. We will balance the play’s childlike quality while still while developing the presentation of the cleverness of the script for the adults. Milo – A 10 to 12 year old who finds everything to be horribly boring. This routine changes when Milo takes a trip through the mysterious tollbooth that appears in his bedroom one day. The Whether Man – A peculiar fellow who says everything three times, the Whether Man is the caretaker of Expectations. He is so busy thinking about what could be and why that he never seems to go anywhere or get anything done. Lethargians (6 roles) – The Lethargians are lazy, energyless, creatures who live in perpetual boredom in the Doldrums. Azaz the Unabridged, King of Dictionopolis – King Azaz is ruler of the realm of letters and words. Azaz and his brother argue over which is more important—numbers or letters, and they banish the princesses Rhyme and Reason. Once he realizes the foolishness of his squabble, King Azaz sends Milo to rescue the princesses. The Mathemagician, King of Digitopolis – Azaz’s brother, the Mathemagician, rules in a world of numbers. Unlike Azaz, the Mathemagician has doubts about releasing Rhyme and Reason. Princess Sweet Rhyme –Adopted sister of Azaz and the Mathemagician; helps to settle all conflicts with her rhymes. When Azaz and the Mathemagician asked them to determine whether numbers or letters are more important, Rhyme and Reason say each is equally valuable. The brothers then imprisoned the two princesses in the Castle in the Air. Princess Pure Reason – Adopted sister of Azaz and the Mathemagician; helps to settle all conflicts with her reason. When Azaz and the Mathemagician asked them to determine whether numbers or letters are more important, Rhyme and Reason say each is equally valuable. The brothers then imprisoned the two princesses in the Castle in the Air. Word Merchants 3 Roles – Purveyers of Words in the marketplace of Dictionopolis. Word Merchant 4 – The Letterman – also a purveyers of Words in the marketplace of Dictionopolis a bit more specialized. Spelling Bee – self-taught master of spelling who loves to show off his skills S-K-I-L-L-S! Advocate for learning. The Humbug – The Humbug is an insect who lives only to flatter people—especially himself. The Humbug is ignorant about everything from math to geography and proves himself the fool by his constant attempts to say intelligent things. After trying to impress King Azaz, he accompanies Milo and Tock on their journey. The Duke of Definition-Minister 1 – Dictionoplolis’ governing cabinet of redundant word bureaucrats. They masterfully explore synonym and redundancy. The Minister of Meaning – Minister 2 – Dictionoplolis’ governing cabinet of redundant word bureaucrats. They masterfully explore synonym and redundancy. The Earl of Essence – Minister 3 – Dictionoplolis’ governing cabinet of redundant word bureaucrats. They masterfully explore synonym and redundancy. The Count of Connotation – Minister 4 – Dictionoplolis’ governing cabinet of redundant word bureaucrats. They masterfully explore synonym and redundancy. The Underdecretary of Understanding – Minister 5 – Dictionoplolis’ governing cabinet of redundant word bureaucrats. They masterfully explore synonym and redundancy. Dr. Kakofonous A Dischord, Doctor of Dissonance – A quack doctor who only prescribes horrible noises. A scientist who enjoys creating unpleasant sounds, and curing pleasant sounds. The Aweful Dynne – a genie who collects noises for Dr. Dischord. The Dodecahedron – an inhabitant of Digitopolis with twelve faces, each of which shows a different emotion. He leads Milo and his companions through the numbers mine, where workers chisel out gemlike digits, to the city of Digitopolis. 6 Miners of the Numbers Mine – workers who chisel out gemlike digits. Broken gem digits are used for fractions. The Terrible Trivium – The Terrible Trivium is a demon with no facial features. He lives in the Mountains of Ignorance and preys upon travelers convincing them to undertake tasks that can never be completed. The Demon of Insincerity – The Demon of Insincerity tries to scare Milo and his companions off their path through the Mountains of Ignorance by throwing half-truths at them, which are only dispelled when they see this demon for what he really is. Senses Taker – The Senses Taker spends his days in the Castle in the Air trying to rob people of their senses by bombarding them with detailed questions. Chip has served the company as producer, technical director, lighting, sound, and set designer, stage manager, production photographer, and, on occasion, has acted for the company. He remains active on the PPF Board and in marketing and publicity for the company. He has been nominated for more than 20 WATCH awards and is an eight-time WATCH award winner in a variety of production categories. As a director, Chip’s focus is on holistic, balanced productions with strong, tightly integrated production values and on ensuring that all involved have a great time working on the production.